ClubCoins Needed: 99 Please note that this item is not available on your device. You may add the item to your Wish list and redeem from a compatible device. Stephen Fry and John Bird star in all four series of the BBC Radio 4 satirical comedy, plus the 2006 special episode. 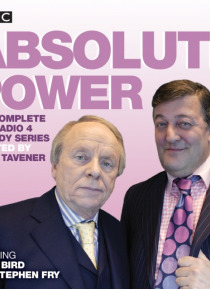 Set in the Machiavellian world of modern PR, Absolute Power introduces us to London-based 'government-media relations consultancy' Prentiss McCabe, whose partners Charles Prentiss and Martin McCabe are frequently embroiled in the machinations of the British political system. Prenti… ss is ruthless, unscrupulous, and will go to almost any lengths to pull off a big commission, while McCabe does have a moral compass, but is too laid-back and fond of claret to use it very often. In episodes that could have been written yesterday, the duo's targets for makeover include the Conservative Party; The Sun; the Mayor of London; the Church of England; Radio 3; English sporting success; the elderly; prisons; the Prime Minister; the Health Service; a Big Brother star; a tennis pro; men; the BBC; 'the notion of Nation'; healthy eating and the US Presidential Campaign. This complete collection includes all 21 episodes of the four series, first broadcast between 2000 and 2004, plus the special 2006 episode. Stephen Fry and John Bird star as Charles Prentiss and Martin McCabe, with Tamsin Greig as rival spin doctor Gayle Shand.